Stories about the Man on the Moon go back centuries, but in Asian folklore it’s not a man on the moon, but a rabbit. It relates to a story about a rabbit who sacrificed himself for an old man. The old man turned out to be Śakra, the King of Heaven, in disguise. Touched by the rabbit’s selfless act, Śakra drew the likeness of the rabbit on the moon so that all could see. With that in mind, it should come as no surprise that the latest coin in Mongolia’s new Woodland Spirts series showcases an extraordinarily adorable rabbit as one of the creatures depicted in the series. Interest in Mongolia’s Woodland Spirits series skyrocketed after it debuted in Berlin at the 2018 World Money Fair. Joining 2018’s Fox, this year’s big-eared Rabbit looks to continue where the fox left off. This superb coin displays a beautiful, high-relief design of a Rabbit poking its head out from a patch of colorized wildflowers. The detail is incredibly intricate thanks to CIT’s smartminting® technology. This coin is official Mongolian legal tender and comes struck in a full ounce of 99.9% fine silver to a Proof-Like finish. In addition, the Numismatic Guaranty Corporation (NGC) has graded these coins to be in perfect Mint State-70 (MS70) condition. 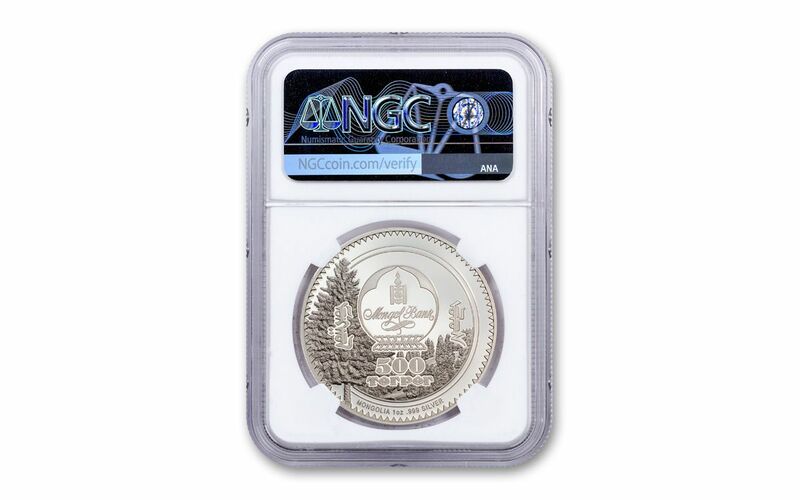 Furthermore, NGC has certified that they are First Releases (FR) coins and encapsulated them in special coin holders with labels attesting to that fact. There is no shortage of animal-themed coins ranging from the cute to the ferocious. Never has the long-eared floppiness of the backyard bunny been better depicted than on this one-ounce silver colorized coin . With a stunning combination of one of the world’s cutest animals and minting technology elements, this coin would enhance any collection. Hop to it and order yours today! INCREDIBLE MINTNG TECHNOLOGY FOR INCREDIBLE DETAIL – This coin was struck using Smartminting© technology, an advancement in minting that brings out the finer details. STRUCK IN PURE SILVER – Your 2019 Mongolia Silver Rabbit is minted in one ounce of 99.9% silver and features a unique antique finish – a finish that complements the design perfectly! LEGAL TENDER IN MONGOLIA – With a denomination of 500 Tögrög, your coin is legal tender in Mongolia – struck at the Mayer Mint in Germany, which produces exceptional quality coins for several countries. 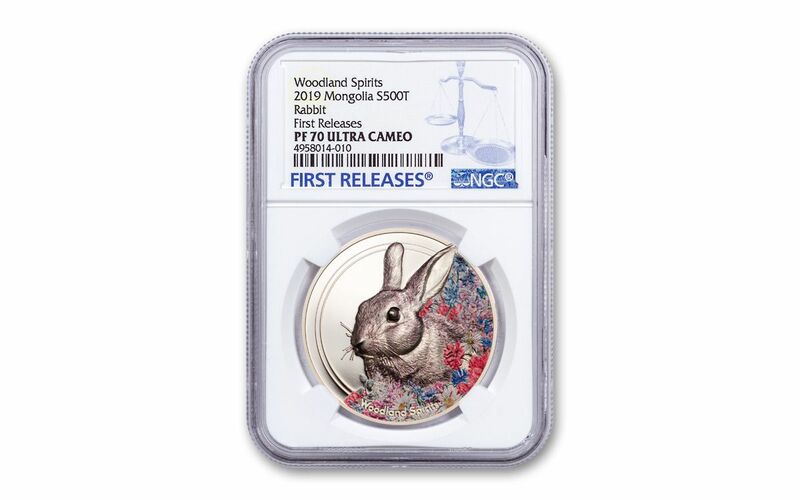 GRADED IN PERFECT UNCIRCULATED CONDITION – Your 2019 Mongolia One-Ounce Silver Woodland Spirits Rabbit Proof-Like coin has been graded by the Numismatic Guaranty Corporation (NGC) as being in perfect Mint State-70 (MS70) condition. In fact, even though this wasn't struck as a proof, this coin's brilliant and reflective finish has earned it a Prooflike (PL) designation from NGC. KEY FIRST RELEASES CERTIFICATION – Your coin will also be certified First Releases (FR) by NGC, a designation that means your coin was received by NGC or an NGC-approved depository within the first 30 days of the coin’s release. LIMITED WORLDWIDE EDITION LIMIT – This stunning coin is from a limited mintage of just 1,500 for worldwide release! Don’t miss out on the latest entry in this colorful series – add one of these perfectly graded colorized silver Rabbits to your cart!